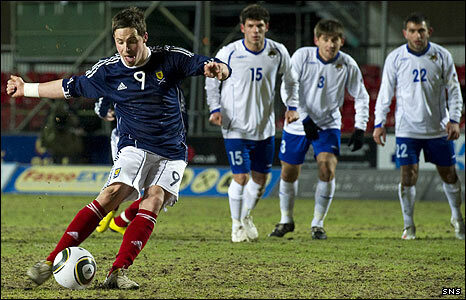 Scotland's hopes of reaching the 2011 Uefa Under-21 Championship were dented by an embarrassing home draw against 10-man Azerbaijan. The visitors played more than hour with a man less but twice took the lead in Falkirk with long-range shots. Chris Maguire scored from the penalty spot after Tural Akhundov was dismissed for deliberate handball. Leigh Griffiths nodded in a second equaliser on 65 minutes but the Scots could not find a winner. The Scots, who beat Azerbaijan 4-0 in their last outing in Baku in November, now sit on 13 points from six games in qualifying Group 10, along with Austria, while Belarus are a point behind, having played a game less. Billy Stark's side travel to Belarus next and finish the campaign at home to top seeds Austria. Azerbaijan arrived in Scotland without a point from their five previous group games but Nizami Hajiyev gave them a shock lead on 13 minutes, with a strike from distance that bounced in front of keeper Alan Martin before finding the net. Scotland won a 32nd-minute penalty after Tural used his hand to prevent David Goodwillie's header from a Maguire cross finding the net. With the defender dismissed, Maguire tucked in the spot-kick to restore parity. The home side pressed in attack but the visitors held firm until the 63rd minute when, out of the blue, they sensationally forged ahead again when Araz Abdullayev drove a wonderful shot from the edge of the penalty area across Martin and into the far corner. Substitute Griffiths levelled two minutes later with his first touch of the ball, the Dundee striker heading Maguire's perfect cross home from eight yards. In a frantic finale, Maguire curled a shot narrowly wide from 16 yards and Stephen McGinn had the ball in the net with five minutes remaining but was ruled offside. "There was no complacency in any shape or form. "We spent a lot of time speaking to the players about that and reinforcing the things that work for us. "One of those things is working the opposition and pressing and it was disappointing that we didn't get to that level. "It is a missed opportunity but we have beaten Belarus and we lost to Austria when we think we should have won the game, so it's all to play for. "A win would have put us in a really good position but there would still have been a bit to do to qualify. "We would have certainly have had to win one of the games and I think that remains the case." Scotland U21: Martin, Caddis, Easton, Scobbie, Perry, Coutts, Arfield, McDonald, Maguire, Goodwillie, Murphy. Subs Not Used: Gallacher, Mitchell, Wilson, McGinn, Shinnie, Griffiths, Loy. Goals: Maguire 32 pen, Griffiths 65. Azerbaijan U21: Agayev, Tural Akhundov, Vurgun Huseynov, Tarlan Guliyev, Abdullayev, Emin Guliyev, Javid Huseynov, Amirquliev, Quluzada, Seyidov, Hajiyev. Subs Not Used: Novruz Mammadov, Novruzov, Mustafayev, Agil Mammadov, Rahimov, Imamverdiyev, Huseyn Akhundov. Sent Off: Tural Akhundov (32). Goals: Hajiyev 13, Abdullayev 63.